With almost half a million dead and half the population of Syria displaced, the scale of the slaughter and devastation can be overwhelming and we can feel powerless to help. 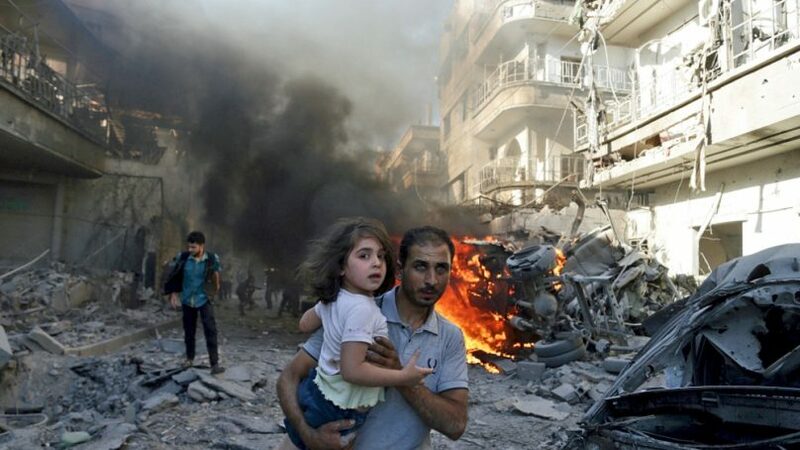 Assad and his close allies Russia and Iran are flouting humanitarian concerns and are deliberately targeting civilians, hospitals, rescue workers, medical staff and essential infrastructure like waterworks and bakeries. ISIS and the coalition airstrikes add to the devastation. A million people are being subjected to medieval starvation sieges, the vast majority by the regime aided by Iran and Hezbollah, with crops in the fields being burnt. Detention without trial and torturing of prisoners to death are routine, it is estimated that up to 60,000 have died in Assad’s prisons, while about 60,000 more are currently imprisoned. Syrians resident in Ireland are desperately worried about family members still living in Syria. Since the start of the Syrian revolution the Assad regime has used the threat of Islamist terror as a cover for its war. In fact in 2011, far from combating Jihadism, Assad released thousands of known Jihadists from prison. Since September last year Russia has intensified its bombing of the civilian population and infrastructure while portraying this as a targeting of Daesh/ISIS. The Russian air force has carried out many strikes against civilians, schools, hospitals, rescue workers and other targets and a much smaller number against Daesh/ISIS. Doctors and other medical professionals in Syria have been deliberately targeted for murder by the regime and its allies. Many journalists have been killed, detained, tortured and disappeared, including Marie Colvin. Schools have been targeted, with resultant deaths of children and teachers. Half of Syrian children do not go to school. Civil defence rescue workers are especially exposed by the notorious ‘double-tap’ airstrike whereby follow up airstrikes are aimed at the rescue team themselves. Irish trade unions and professional bodies could play a part in highlighting the atrocities against their colleagues in Syria, but so far have failed to do so. A million Syrians have been besieged for the past three and a half years and are starving to death, deprived of food and medicines. Almost all of these sieges are being perpetrated by Assad who has absolutely refused to allow any but a token amount of humanitarian aid to be delivered to areas he is besieging. 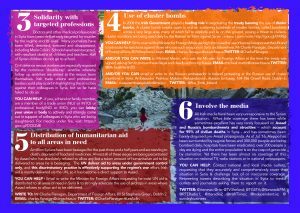 The UN does deliver aid to areas under government control, which discriminatory practice is effectively supporting the regime’s war effort. Irish aid is mostly delivered via the UN, so it has become a direct support to Assad. You can help by emailing or writing to the Minister for Foreign affairs to ask him to insist that UN aid is distributed to all areas of need in Syria and to strongly advocate the use of airdrops in areas where Assad refuses to allow aid to be delivered. Mr Charlie Flanagan, Department of Foreign Affairs, 80 St Stephens Green, Dublin 2. charles.flanagan@oireachtas.ie Twitter @CharlieFlanagan #LetAidIn. 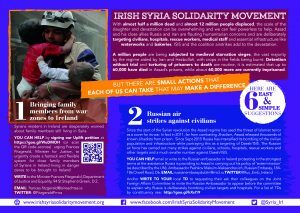 The media in Ireland, print, broadcast and online, have been very unresponsive to the Syrian situation. What little coverage there has been while sometimes excellent has very rarely focussed on Assad and Russia’s bombardments and atrocities – which account for 95% of civilian deaths in Syria – and has sometimes been barely disguised pro-Assad propaganda. For example as we write, Aleppo has been surrounded by regime forces and 300,000 people are being bombed daily, hospitals have been eradicated, over 200 people a day are dying and the entire population is on the cusp of genocide by starvation. Yet there has been almost no coverage of this situation on RTE or other national TV and radio stations or in national newspapers.